Originally from Pittsburgh, PA, Regis received numerous solo and chamber music awards before receiving his Bachelor’s at Juilliard and his Master’s at the Manhattan School. He appeared as soloist with Tchaikovsky Competition Gold-medal-winner Elmar Oliveira in a series of violin duet albums for the Paganiniana and Musical Heritage Society record labels. He is also soloist on the New World Recorded Anthology of American Music, an archival collection honoring the United States Bicentennial. He was Concertmaster of internationally known New York Pro Arte Chamber Orchestra. 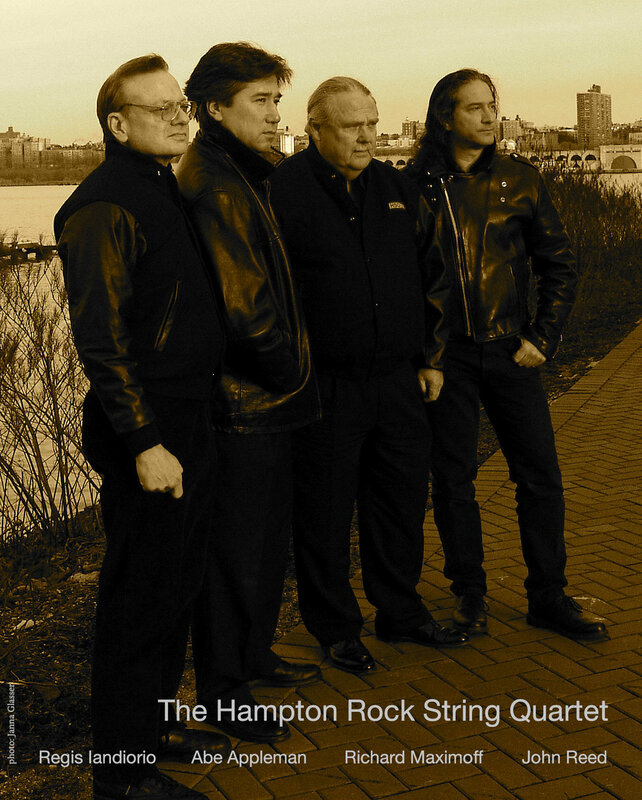 Before joining HSQ, he was first violin of The Hofstra String Quartet. Mr. Iandiorio is one of the most requested recording artists in New York City. Born in Yokohama, Japan, Abe began his studies on the violin and piano at age four, soon after which his family moved to the Boston area. He made his debut, at age 15, performing Bruch’s Gminor Concerto with the Boston Symphony Orchestra. Mr. Appleman has had a multifaceted career, performing in Asia, Europe, and the Americas as a soloist, concertmaster and chamber musician. He is a founding member of the ensemble ‘Voce Intimae.’ He has served as concertmaster of the Colorado Music Festival and was concertmaster of the Atlantic Classical Orchestra in Florida. In New York City, Mr. Appleman performs regularly in the 1st violin section of the Metropolitan Opera orchestra and is one of the foremost violinists in the recording industry. He can be heard as a soloist on numerous CDs and motion picture sound tracks and is regularly invited to perform with the Boston Symphony at the Tanglewood Music Festival. Raised in Texas, Richard reached full scholarship Doctoral candidacy at Juilliard and was a member of the Pierre Boulez Contemporary Ensemble. As principal violist of various chamber groups, he premiered compositions by Bernstein, Britten, Copland, Hindemith, Messiaen, Milhaud and Stravinsky. He appeared as chamber music soloist at the White House during two Presidential administrations (Johnson and Nixon) and has recorded extensively in New York City for TV and film. A native New Yorker, John was trained from age 7 through 17 at Juilliard punctuated by summers at Meadowmount School of Music. He received a BFA from SUNY Purchase and then studied at Yale. His teachers have included Leonard Rose, Harvey Shapiro, George Ricci, Aldo Parisot and Janos Starker. He has performed over the tri-state area with his brother, (also Juilliard trained and now retired violinist with The New York Philharmonic) and mother (Juilliard graduate on piano). Extremely active in the New York City studio and freelance scene, and in over 15 Broadway shows, Mr. Reed has performed with many notables including Tony Bennett, Judy Collins, Peggy Lee, Smokey Robinson and Dionne Warwick to name just a few. As principal arranger for HSQ, Mr. Reed has scored over 100 arrangements, which have been aired on TV and radio, played with ballets and published and sold throughout the U.S., Europe and the Far East. He was the recipient of full scholarships at two consecutive Congress of Strings, 1st place in the Great Neck Youth Competition, invited to Brazil for two consecutive summers for the Funarte MECMusic Festival and attended the Adirondacks Music Festival with Janos Starker. Mr. Reed is past president of the String Industry Council (SINC) and a board member of the American String Teachers Association (ASTA).